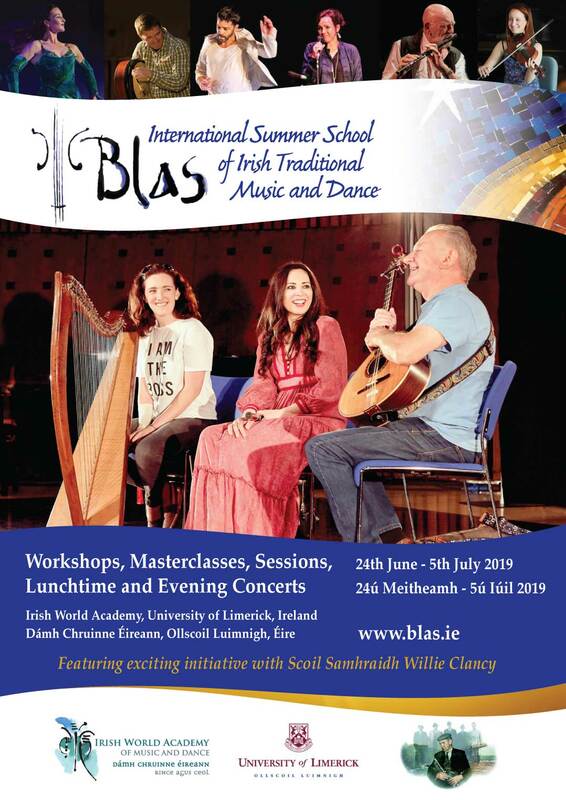 The Blas International Summer School of Irish Traditional Music and Dance returns to the Irish World Academy at the University of Limerick for the 23rd successive year this June 24th – July 5th. The summer school will be launched on Monday June 24th where students attending the course at the University’s Irish World Academy will benefit from the wisdom and tutelage of eminent figures of the Traditional World such as Dónal Lunny, Paddy Glackin, Siobhán Peoples, Louise Mulcahy, Jim Higgins, Colin Dunne, and Karan Casey, to name but a few. Following its launch, a range of public events will take place throughout the summer school, including the annual Francis Roche Memorial lecture, the Blas Bilingual Interview with RTÉ Raidió na Gaeltachta’s Áine Hensey, and daily lunchtime concerts with Blas tutors. Further information can be found on the Blas Summer School website.